My visit to South Korea during winter in 2005 was really unforgettable. After a few hours flight, I had to adapt myself to a totally different climate. Wow, that was an amazing experience. The winter temperature of South Korea is below 0 C. I am from a tropical country with hot weather for the whole year. The daytime temperature is above 30 C and the temperature is around 30 C at night. There is a great difference in temperature between my country and South Korea. I had never spent my life in winter before I stepped on the land of South Korea. That was my first experience in my life. The winter of South Korea is too cold to me. I had to put on four layers of clothing and looked like a clumsy astronaut. 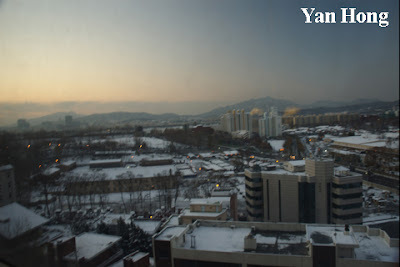 This photo was captured from the window of the hotel that I stayed when I was travelling in South Korea. As shown in the photo, the top of the buildings were covered with snow. You could imagine how cold it was. Burrrrr...cold !!! Check out my site "Struggling Parents, I TAGGED you...Have a great day !!! i went there in march...i managed the cold weather :) but it's nice to see the snow.